The United States is experiencing an “economic collapse” because major powers like China and Russia have decided not to use US dollar in trade, a political analyst says. “The American economy is just beginning to collapse. China, Russia and many other countries are moving away from using the US dollar in trade,” Linh Dinh said in an interview with Press TV on Tuesday. 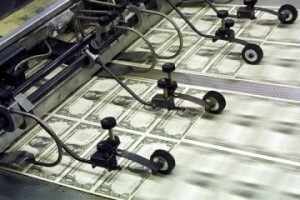 “So when the US dollar loses its status as reserve currency, life will get much harder here. But coming months will show how desperate this situation is, so the lies will be even more insulting to people who have to suffer daily in this situation,” he added. The analyst criticized American news media for not telling the truth about the economic situation. “The lying media put out news that the so-called recovery is picking up speed. The new lie is that the unemployment rate is down to 7 percent, but this is pure nonsense. In fact, only 47 percent of American adults have full time jobs, and 40 percent of US workers make less than $20,000 a year,” he said. “Many people make so little, they must rely on food stamps to buy groceries. Many go to church pantries. I know a family of four, with two jobs, who must do this. The father, with a full time job, must also sell blood occasionally,” Linh Dinh explained. He also compared Americans’ income with their monthly spending. “Even as the big banks receive bailouts and make record profits, they pay their bank tellers only $12 an hour, before tax, and a minimum wage worker only makes a ridiculous $8 an hour. Some even less. Meanwhile, prices go up, especially for food, rent and gas, but the inflation figure is also a lie,” he said. “There are tent cities in every state now. Within a hundred miles of where I am, there are several tent cities where people live in the freezing cold and defecate into a bucket. Does that sound like life in the so-called greatest country on earth?” he asked. “Meanwhile, the richest Americans become even richer, and this is all thanks to a government that serves only the richest, while masking over their failures and betrayal of ordinary Americans by lying about it, daily,” he concluded.